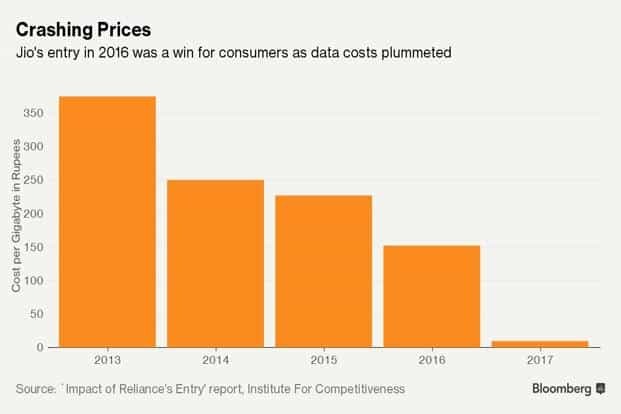 Within two years, India’s richest person turned the local mobile-phone market into the world’s biggest consumer of wireless data. But along the way, billionaire Mukesh Ambani laid waste to profits in the overcrowded industry by driving down prices to as low as zero. Ambani leads Reliance Jio Infocomm Ltd., which has gone from zero to more than 200 million subscribers, all of them on a nationwide 4G network, since 2016. While the user growth has come at the expense of smaller rivals who’ve merged or quit the market, the thrust into the country’s No. 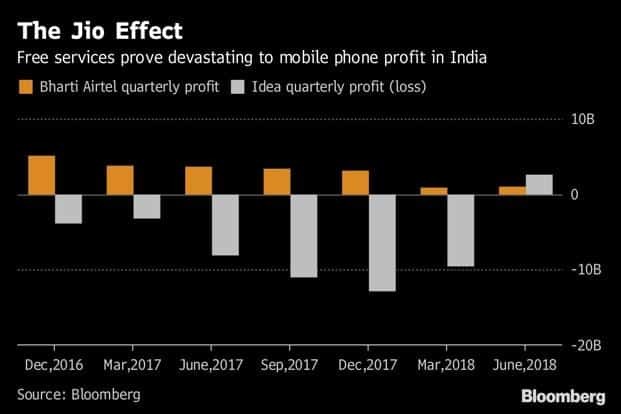 3 spot for wireless carriers has also ravaged profit at Bharti Airtel Ltd., and Idea Cellular Ltd. The latter has merged with Vodafone Group Plc’s India unit to overtake Bharti as the market’s biggest operator. Meanwhile, Reliance Jio, a unit of Ambani’s energy-to-retail conglomerate Reliance Industries Ltd., has reported two quarters of profit, driven by subscription growth that has continued even after the company began charging for data services. The company is due to report earnings Wednesday. Consumers have been the clear winners, as the cost of sending and receiving data wirelessly has plummeted. The plunge in prices has led to surge in data traffic to 1.5 billion gigabytes a month last year, according to Amitabh Kant, chief executive officer of NITI Aayog, India’s government policy think tank. “Mobile data consumption is higher than USA & China put together," Kant posted on his Twitter account in December 2017. While users benefit from declining prices, losses are expected to continue at the country’s big three surviving carriers. Bharti will probably report an 8.1 billion rupee ($110 million) net loss for the three months ended 30 September, according to the average of analyst estimates. The Cellular Operators Association of India expects more losses ahead for the industry. “I see at least another three quarters of losses," said Rajan Mathews, director general of the industry group. “I don’t think the present tariffs are sustainable." 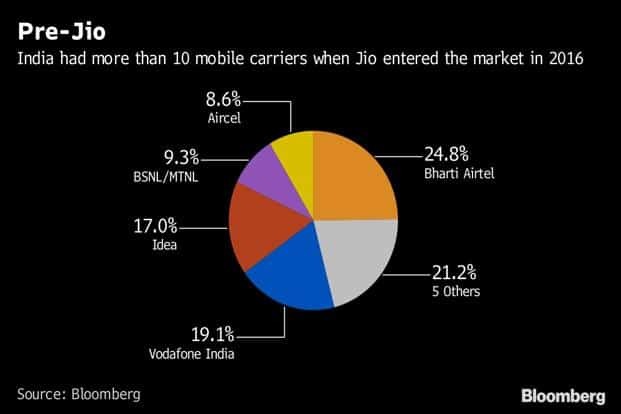 Prior to Jio’s entry into the market, India had more than 10 wireless providers, with the smallest five accounting for about 21% and Bharti, the largest, taking up 25%. 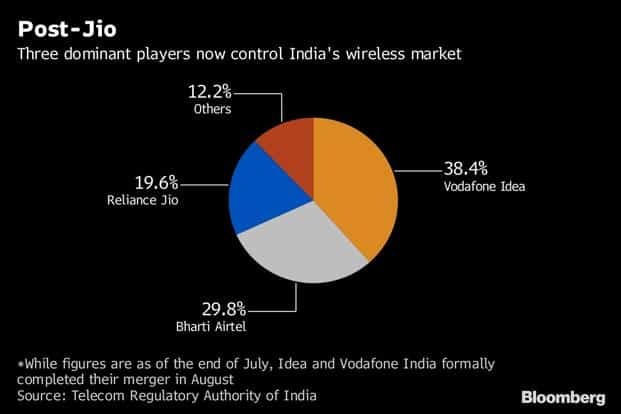 Since Jio stormed in with introductory free data and voice services, the market has consolidated into three big providers, including Vodafone Idea Ltd., which completed its merger at the end of August.